It could hardly be argued that, upon embarking on the task of translating content from one language to another, you need a basic knowledge of the core rules governing each. Only then will you be able to start traversing the mangrove-like grounds of interpreting and translating those rules back and forth. So, for instance, if you don’t grasp the concepts of elliptical pronominal subject and the requirement for opening marks for questions and exclamatory sentences in the Spanish language, you will probably have a hard time understanding it, let alone translating into it. You should probably be aware of the restricted use of gerunds among the most popular Romance languages if you plan to include them in your language pair. And, alas, beware of the faux amis, such as “actually”, “realize”, “argument” and “divert”, else they can stab you in the back or haunt you at night, if you’re a latin-rooted descendant. Is being familiar with these little pieces of basic information enough to fit in the professional translator trousers? This question actually (and currently) calls for a much deeper debate, so I guess my short answer (and bland, I admit) will be that translators should strive to gradually acquire and master all useful rules and standards for their language pair and move from there. But, as in any system, there can be several layers of rule compliance and many types of system users. Let us step back a bit and take a look at the ancient game I shall use to draw an analogy with another “system” which, I find, relates to us language workers. I would say that a prime example of a working system is the game of Chess. In rough terms, Chess is a two-person game consisting of a board on which a definite amount of pieces are laid out. There, each type of piece is, more or less – depending whether we’re talking about kings, queens, rooks, knights, bishops or pawns – restricted to a definite set of movements that will be put forward to advance, retreat, attack and defend during the match, with the ultimate goal of forcing the opponent into the unavoidable check of his King, i.e. under threat of capture. – What the hell is a Four-circle Kappa Geometry X-ray Goniometer? White bishop captures unguarded Black Knight. Players take turns to move their corresponding pieces (there are black and white pieces, the latter in charge of moving first according to the rules) with the intent of progressing across the board and gaining an advantage over the opponent by capturing his pieces. – You want this delivered by tomorrow morning? Too late for Castling, your King is on a weak spot. This is a very brief and probably not-so-accurate description of the game – but the point I am trying to reflect is that it is a very complex, intricate practice, where a myriad of underlying layers can be woven together. And I emphasize that this is only a possibility not a certainty: a game of Chess played by two beginners with only a knowledge of how the pieces move will most likely turn out to be very shallow and lacking of any tactics or strategy whatsoever. On the other hand, there are people who spend their lives studying the game and hundreds of books have been written on chess theory and famous plays and matches. – What are fuzzy matches? I’m starting a feel a bit fuzzy myself, does that help? Out of Rooks and your Queen is stranded. Without going into a thorough analysis, I think many would agree that Language could also be regarded as comprising a definite set of rules, under which Black and White words are laid out across an infinite number of boards and an infinite number of positions (a particular sketch from “Fry & Laurie” comes to mind as I write this). So, who, would you say, is particularly drawn into messing around with this game of utterances, on wooden knights, chasing mischievous Queens? No actual Indians were conquered during the shooting of this picture. And they are, first and foremost, supposed to be proficient with the rules of Grammar, Syntax and Spelling of their language pair in order to be able to then successfully plunge into the seas of Semantics, Terminology and Cultural Adequacy, ever-present in the daily life of linguists. 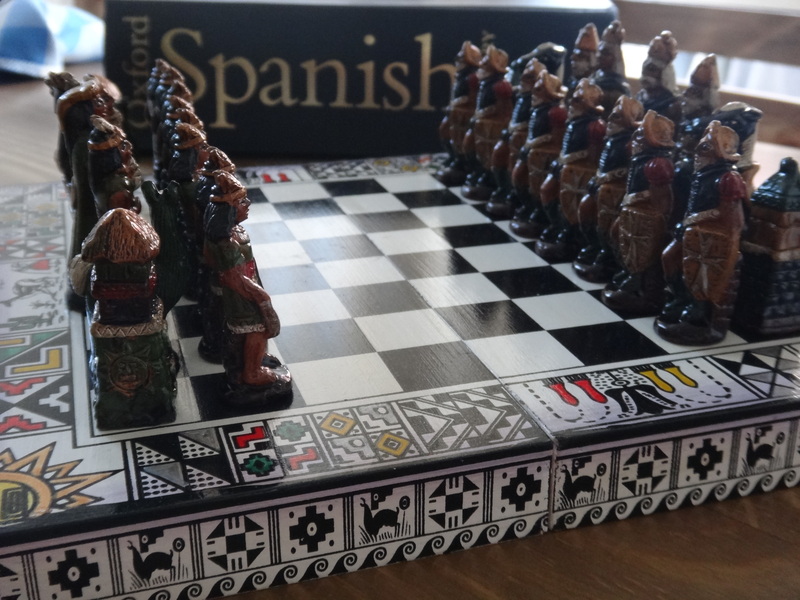 I like to envision, then, all the Chess pieces on your side and the knowledge of their corresponding movements as the fundamental, yet starting, kit for the emerging translator, about to dive into the professional market. He knows what’s on his squares and has a somewhat definite idea of what he can do with it. However, he doesn’t know what to expect coming from across the board. What he’s up against. The opponent moves are still unknown and with only theoretical knowledge, predictions are likely to be flawed by inexperience. – What do you mean by Quality Review? Am I still going to be paid for this? Check. I’m sure most translators go through this initial phase where most texts to translate don’t seem to make any sense at first, and time ticks by so fast you feel you’ll never make the deadline. It’s only natural, as is being defeated in Chess by any opponent with more experience and skills than you. It will also be natural, and desirable, that you gain insight from each and every game, to perform increasingly better as time goes by and you learn from your movements, and anyone else’s you come across. It’s best to put your pride away and any Kasparov wannabe stance, and humbly embrace any feedback coming from the victors. Hopefully, after many a condescending pat on the back, the naive translator will begin to foresee many of the frequent openings, middlegames, forks, and checks, that loom over the challenging game of translating languages.